OFFICIAL REMINGTON UK Authorized Retailer for over 10 years. IMPORTANT NOTICE: IPL6250 IS NOT SUITABLE FOR USE ON FACE. Please refer to REMINGTON IPL MANUAL- LINK given below to make sure. Its suitable for your needs. This model comes with a 220V UK or EU PLUG cable. Travel adaptor is provided FREE OF COST inside the box for local use. The Device itself is BIVOLT 110-240v and can be used anywhere in the world with use of a local travel adaptor. NEW MODEL - Infinity LAMP / CARTRIDGE - wil. L last LIFETIME - no more changing Lamps! 50% Bigger, Clinically Proven, Infinity Bulb, Multi Flash, Permanent Hair Reduction. IPL ProPulse, Safe & Effective, Unisex, Worldwide Voltage. FAST: Permanent results in 3 treatments. SAFE: Clinically proven, FDA Cleared. 50% Bigger Window: 3cm² (3 second flash rate). Multi Flash & Single Flash mode. 110-240V WORLDWIDE USE- Local country Adapter will be provided FREE OF COST! In clinical testing on the body, treatment sites showed up to 94.3% and on average 66% fewer hairs twelve months after just three treatments. Similar to results observed from professional hair removal devices. 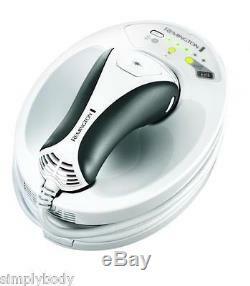 Remington IPL6250 i-LIGHT Essential Hair Removal System. Join the hair removal revolution with the Remington i-LIGHT ESSENTIAL. With this genius device you can achieve permanently hair free, smooth skin, effortlessly and pain free in the comfort of your own home. I-LIGHT ESSENTIAL harnesses the most advanced and innovative technology to deliver exceptional and permanent results after just three treatments. Featuring unique PROPULSE, clinically proven Intense Pulsed Light technology, that targets hair directly at the root, this hair removal hero delivers super-smooth skin for total hair freedom. Both men and women can use the Remington i-LIGHT ESSENTIAL on areas below the neck including the legs, arms, underarms, bikini line, back, chest and shoulders. With an ergonomic, sleek white and silver design and comfortable hand piece, it is gentle to the skin and super easy to use. Thanks to the infinity bulb, there are no hidden costs, youll never need to replace or be left without the tools you need to achieve beautifully smooth skin. Advanced PROPULSE technology works by heating the hair follicle, focusing light energy at the root to break the cycle of growth. The light energy is absorbed by the melanin in the hair and suppresses growth by stunning the follicle. The built-in three second flash rate, along with a 50% bigger flash window with UV protection Filter. To protect your skin, means you can easily treat your desired areas and enjoy. Beautifully smooth skin in no time at all. Remington has been helping the world get ready for over 75 years. As one of the experts in innovation we pride ourselves on being at the very cutting-edge of technology and work with top salon professionals from all over the world to produce electrical personal care products that really work, care for you and deliver superior results every single time. The item "NEW Remington IPL6250 i-Light Pro IPL Body Hair Remover- Infinity LAMP" is in sale since Friday, January 01, 2016. This item is in the category "Health & Beauty\Shaving & Hair Removal\Laser Hair Removal & IPL". The seller is "brandmovers" and is located in london. This item can be shipped worldwide.